Active Antenna Amplifier Kit is now available for purchase. Minimal additional efforts are needed to complete this active antenna project. For more details look at the Active Antenna Amplifier Technical Section. This kit consists of two SMD mounted PC boards – an amplifier board and a control board. The amplifier has low noise, high dynamic range and wideband properties. It has separate current and voltage amplifiers for the different antennas. It is a balanced design and uses monolithic pairs. The balanced power amplifier uses medium power BJT with very low IMD and can give approximately 75 mW of output power on a 50 ohms load in order to minimize the non-linear distortions. 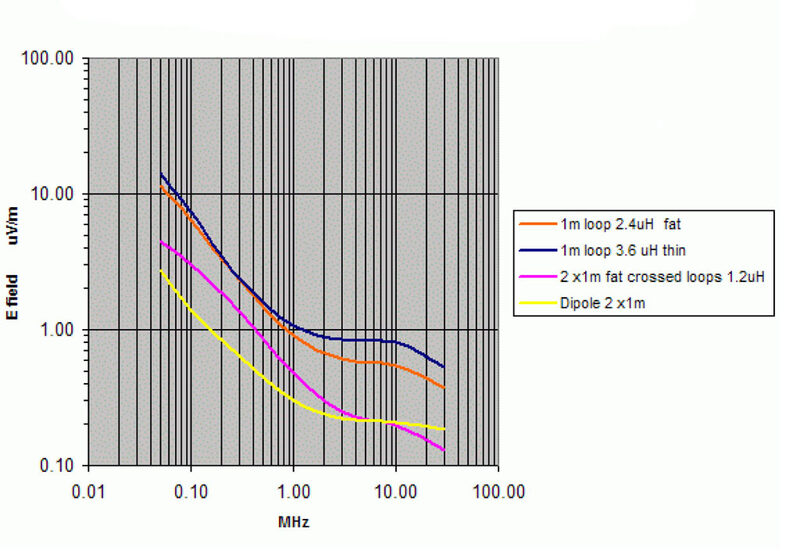 The small antenna frequency response in all modes is flat in a wide frequency range. 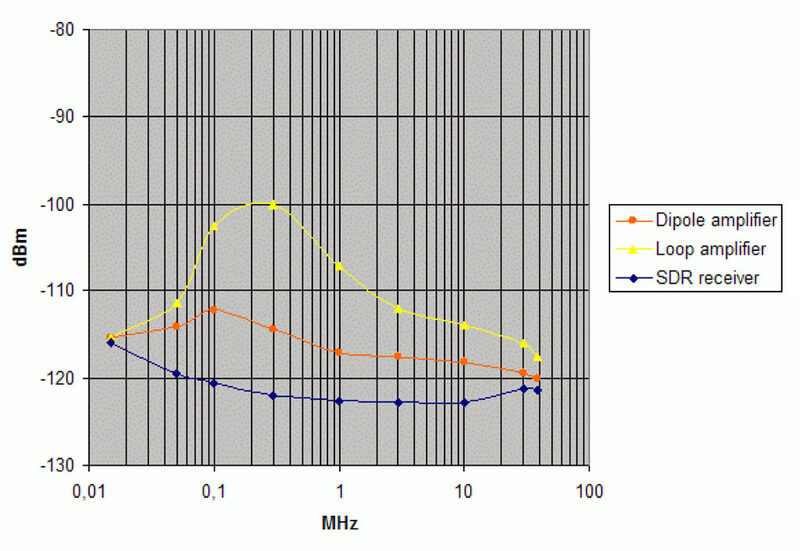 Usable frequencies are from 20 KHz up to 55 MHz. The antenna gain in the current and voltage mode is set to be approximately the same to avoid striking differences in the gain when the antennas are switched. Every kit set has been tested. The amplifier is connected to the receiver via a control box and an FTP (shielded CAT5E) cable with RJ45 connectors which ensure good balance to avoid common mode noise signals. The cable length can be above 100m. There is a possibility to limit the maximal voltage applied to the receiver input which is needed for some direct sampling SDR. The amplifier has jumpers for setting it to the particular environment. It is of SMD design and is mounted and tested. 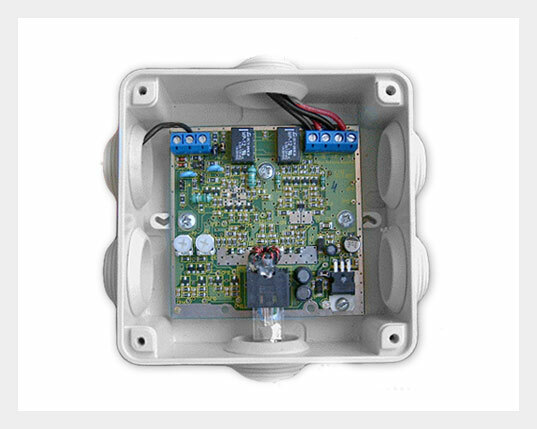 The amplifier input is protected from high electromagnetic field intensities – it can be used with magnetic and electric small antenna in the immediate vicinity (20 – 30 m) of transmitting HF antennas even if the power is 1 – 2 KW. The amplifier has input filters to reject the frequencies above 55 MHz to avoid the influence of strong stations in the broadcast FM band (80-108MHz). The amplifier is powered by a nominal 13.8 V (12.3 – 16 V margins) DC power supply @ 145 mA nominal current. The standard existing power supplies (PS) for the transceivers or receivers can be used. The amplifier is mounted in an ABS plastic (IP55 protected) box. It can be used with any receiver which has sufficient sensitivity and 50 ohms input impedance. This amplifier can be used as a building block for more sophisticated antennas such as phased arrays etc. This set of measurements assures that the amplifier has normal gain, frequency response, noise floor and dynamic range. Spice simulated antenna factor Ka for loop and dipole. The circular loop is with single turn 1m diam. made with 25mm diam. alum. tube with 2.4 uH inductance. The dipole has two 1 m long arms – effective height is 1 m. .
Spice simulated input minimal discernible signal (MDS) in [uV/m] for different antennas. The noise bandwidth is 1KHz. First two loops are 1m diam. single turn (thin and fat conductor). 2-crossed loops are loops with 1m diam. circular shape (1.56 m2 total area), each with fat conductor. The dipole is with 2 arms of 1 m. See Antenna section for details. 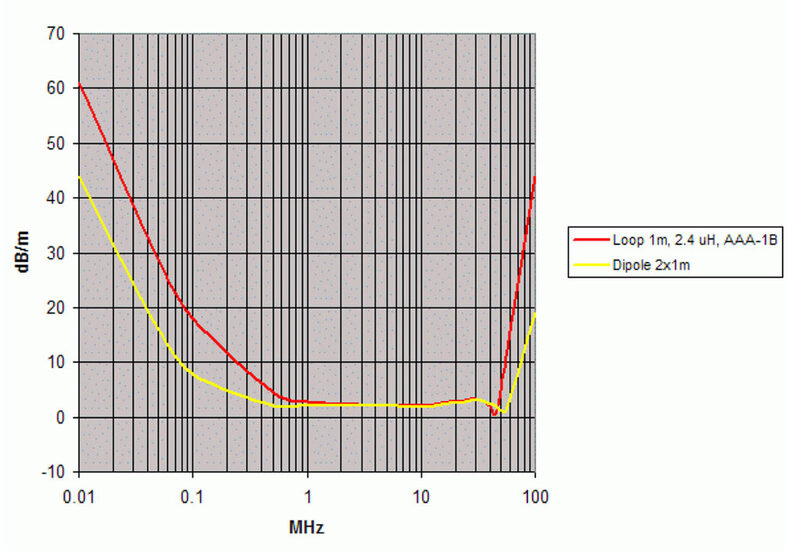 A small loop and dipole models are used which is acceptable up to 10 MHz. For higher frequencies the MDS values might be not reliable. Output noise levels of the active antenna amplifier measured at 1 KHz bandwidth without antenna. The loop amplifier is measured with 2.4 uH equivalent loop inductance connected to the input. The dipole amplifier is measured with 10 pF equivalent dipole capacitance. The equivalent input noise level of a direct sampling SD receiver is given for comparison. Usually the commercial RX and TRX have similar or lower noise floor. This chart is useful to obtain information for the needed noise floor of the receiver which will be used with this active antenna. A practical rule is that the receiver noise floor should be at least 6 dB bellow the output noise level of the antenna amplifier. The price of shipping of a single kit as a “small parcel” (airmail, with priority, not insured, registered mail) is shown in shopping cart. This price is “flat rate” and is the same all over the world.